It's been a long, long while since I've read a book in a day; in fact, so long I can't tell you the last year this happened let alone the day. 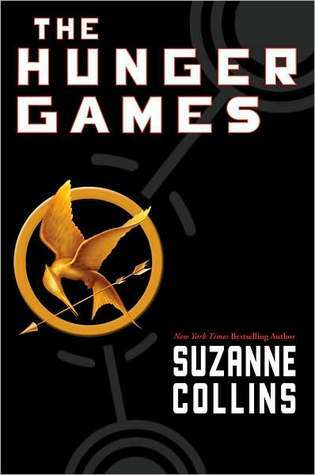 However, I tore right through The Hunger Games by Suzanne Collins. The story was that engaging and compelling - and my Sunday that open for spending curled up with a book on the sofa. While reading the novel, I loved every minute of it. Katniss, the 16-year-old, reluctantly rebellious and strong young tomboy made a lovely heroine, and the dystopian world in which she lived proved an intriguing backdrop, in a 1984 meets Blindness meets Ender's Game kind of way. The setting is this: in some terrible future after a nuclear war has impliedly occurred, there are 12 Districts, the 13th having been destroyed in a rebellion against the Capitol, which seems to be located somewhere like Las Vegas or Salt Lake City. Every year, the Capitol hosts the Hunger Games, in which each of the 12 remaining districts must draw the name of one boy and one girl ages 12-18 to participate as "Tributes." The Tributes, after some crazy high tech fanfare, are then dropped in some vast outdoor 'arena' where they must survive whatever the Gamemakers through at them, and fight to the death until only one is left, deemed the victor. So, yes, a bit bleak and bloody for my tastes, which is why it took me so long to finally pick this book up, especially with all the hype (why does hype always tend to be a dissuasive factor in my choices?). But this is one of those books that draws you right in, nearly hypnotizing you to the last pages. Now, it is a young adult novel, so the themes are not terribly subtle. Moreover, Katniss is a little more clueless about certain things than I think she should be, but perhaps that's true of most teenagers. I found some of what occurred in the Games rather convenient to allow the plot to avoid dealing with larger, baser human issues, and that the strong female lead behaved more like a traditional boy than girl, but I did like that she was small but strong, good with a bow and arrow, clever and occasionally compassionate. This makes me so happy. I think the first book in the trilogy was my favorite (though it's hard to say) but I raced through all three of them...I'm not sure that I've gone through books like this since I discovered Harry Potter. I liked Catching Fire the most (hated Mockingjay, so temper your enthusiasm in case you agree!) Also, one of the reasons I quit GoodReads and only use LibraryThing is the half-star rating ability. Enjoy! Don't you hate that GoodReads doesn't do half stars?? I thought these books would be too "bleak and bloody" for me, too, but I appreciated that there was a point to what Collins was doing (the larger issues to which you allude). I heard her speak about the book when it first came out, which is what persuaded me to read it. Hers was a military family, I believe, which is where some of the themes that show up in The Hunger Games come from. Looking forward to your thoughts on the last two! I'm hoping you like Mockingjay; so many people hated it, but I thought it was perfect! Love a great afternoon of reading. I guess I'll have to admit that I also shy away from titles that receive an almost absurb amount of hype, a reason I decided against purchasing these. I'm also wary of YA novels. I feel little strange picking up a book that's intended audience is so much younger than myself. I did just finish The BOok Thief so I guess I'm getting over that, too. It does seem like the content may be a little heavy for me to stomach at the moment, but I'll certainly keep your enthusiasm in mind if I see it out at a discounted price. I'm looking forward to seeing your next reviews! These books are great so far. Yes, YA, but the story is interesting enough that they are still very enjoyable for the adult reader, much in the vein of Phillip Pullman's HIs Dark Materials Trilogy. I guess a trilogy is the mark of a good series? Who knows. I enjoyed those as well. I'll keep you posted on how the next two go.